Have a favorite movement activity on YouTube that isn't already on GoNoodle? 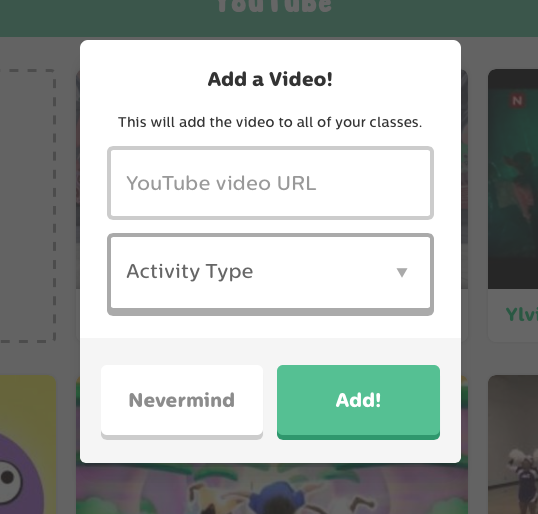 You can add it to your classes in GoNoodle alongside our favorite YouTube videos. Adding a video to one class adds it to all classes. Customize your GoNoodle account with videos you love from YouTube! This feature allows you to add activities your class loves and earn credit for your champ while dancing along. On YouTube.com, navigate to the video you'd like to add. Click the Share tab below the video. Copy the web address (URL). This should start with http://. Log in to GoNoodle and select the class to which you'd like to add the video. Click Channels and select the YouTube channel. Click Add your own YouTube video button in the top left. Paste the web address (URL) of the YouTube video in the first field. Tag it with an activity type -- either "calming" or "energizing." You can delete any YouTube video from your account. This includes both the videos that you add, and the ones added by GoNoodle. From the YouTube channel in any of your classes, hover your mouse over any YouTube video. Click the trash can icon. Confirm that you wish to delete in the pop up. This deletes the video from all classes in your account. Note: If you accidentally delete a YouTube video added by GoNoodle, you can find the web address (URL) here, and add the video back using the steps above. The activities YOU add will only appear in all classes on your account. It will not appear for other GoNoodle users. The most recently added YouTube videos appear at the top, with older videos closer to the bottom. At this time, we do not have a way to sort or organize the videos. You can only add videos from YouTube.com as GoNoodle brain breaks. We do not support other video sites at this time. We do not control the content outside of the activities we add! You are responsible for the appropriateness of the content you choose to add. 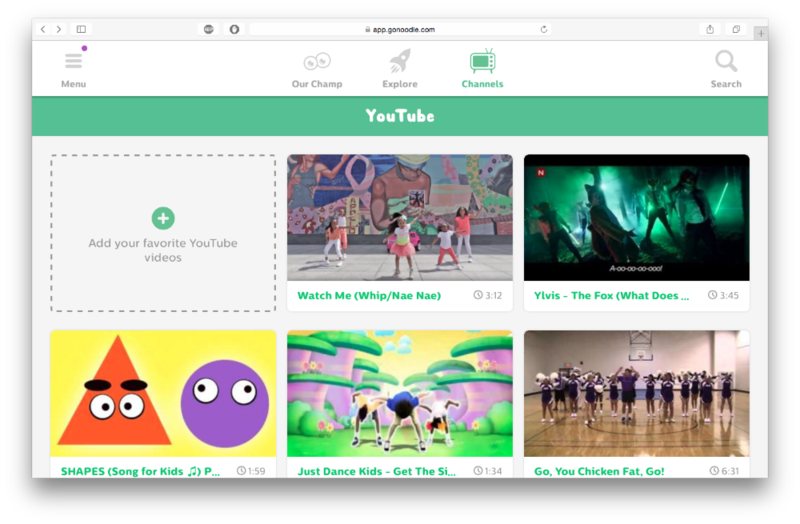 If a video publisher has enabled ads via YouTube, you may see ads on the video inside GoNoodle. The content in the ads is determined by YouTube. We have no control over the ads that display. GoNoodle does not own the content published from YouTube. The publisher of a video may choose to remove that video from YouTube at any time, which means that your chosen video may stop working on GoNoodle. If you have trouble with a video you added to GoNoodle, contact us with the name of the video. You cannot add an entire YouTube playlist to GoNoodle. This feature is only available for Teacher users. Note: Total videos in the YouTube channel is limited to seventy-five videos. This preserves functionality across the site.